Sugar free – Start now learning! The Facilitator asks the group to make a circle and asks one person to start the game by saying a sentence „I am going to the market to buy…”. The participant should list a product which in their opinion does not contain sugar, ex. „ I’m going to the market to buy bread”. Then the next person says the product mentioned by the first participant and adds theirs, ex. „I’m going to the market to buy bread and water”. Each person repeats the list and adds an item. The purpose is to remember all of the products that people have added before and try to list only those that are sugar free. If there is a small number of participants, the game can be repeated in circles. At the end of the game the Facilitator can invite participants to analyze the products listed during the game and prepare a list with a food and drinks and how the sugar contained in each. The exercise should be used as an introduction to the topic – The Facilitator can explain that we eat much more sugar than we should, even in the food and drinks are considered healthy, diet and sugar free. The Facilitator divides participants into smaller groups of 4/5 people and gives each group approx. 500 ml of water in a cup, 20 teaspoons of sugar, 1 teaspoon, a piece of paper and a pen. How many teaspoons of sugar are added to the water? Is the sugar water as sweet as the bottled soda? At the end, the facilitator presents the results saying that the 500 ml bottled sweetened soda contains around 18 teaspoons of sugar – it can be presented by putting the sugar into the bottle. Is the amount of sugar added to the soda more or less than expected? Do you add sugar in your drinks and food? 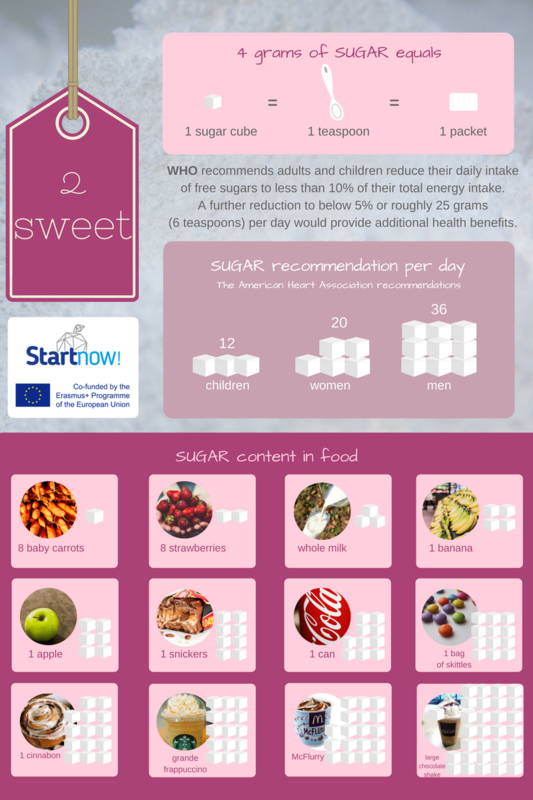 Do we need sugar? When? This short discussion can lead to the next activity. The facilitator divides the group into 2 teams and asks some people to become observers to the discussion. The groups will be debating on the topic „Sugar is needed to keep people healthy”. The task of the first team is to find arguments which will confirm the theory and the second one to look for facts to overthrow it. Both teams should prepare reliable facts and present them in a professional way – using graphs, pictures, notes. The Facilitator will lead a discussion, by letting people from each team speak providing: One argument for and one against. At the end, the Facilitator will conclude the debate and ask the observers to decide which group was prepared better and was more convincing. Then the Facilitator may ask the whole group to rationally decide whether (based on the facts) sugar is healthy for people. In this task, the Facilitator divides the group into 5 smaller ones according to the number of daily meals: Breakfast, Brunch, Lunch, Afternoon snack, Dinner. The division can be done randomly, or the Facilitator can ask participants which meal they want to create and let them choose. The objective of the activity is to come up with a recipe for each meal (it can be inspired by already existing ones) which will be sugar free and that can be prepared by the participants during the classes. After the recipes and the dishes are ready, groups should give them a name, take pictures and promote this activity of the „Start now” project on the social media. At a later stage the recipes accompanied by photos could be printed on a leaflet and distributed to the people as promotional materials. Upon completion of all activities, the Facilitator asks each participant to share with the whole group, using a metaphor to their favourite fruit (which naturally contains fructose): How do you feel?, example – I feel like a red, juicy apple – fresh and healthy. After one week, take the egg shells out and examine what the different drinks have done to them. Each participant or a group should document every day of the experiment by taking photos and writing short notes on how much the egg shells are changing from day to day. The observation could be posted on the social media. Results: The shell in the orange juice should be pretty much dissolved (due to the high acid and sugar contents in the juice). The shell in soda will have brown spots, while the shell in the water should be completely un-touched, demonstrating exactly why water as a drink free of sugar is always the best choice.